I realize the huge faux pas I commit by not updating this blog regularly.. In fact, I may be guilty of telling other people they should update regularly.. God. That’s the worst. All I can say, however, is.. Well, I am a working mum. Moving right along.. Coloured Jeans. 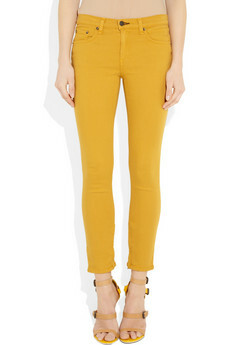 COLOURED JEANS – note the ‘u’ in colour.. I like them. Some of them.. They are very hip right now. Which doesn’t mean you should go buy them. The fact they are so hip may actually prevent a large number of you not to buy them. If you were, however, going to buy some, these are the colours and styles I like. 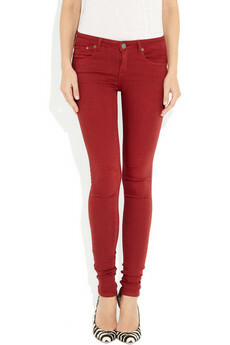 Bright Red – J Brand, my favourite. Bright Yellow, Rag and Bone, second favourite. Pink, Isabelle Marant, I love this pink.. I am not crazy about the light pastel pinks.. It looks too much like your white jeans got mixed with your red t shirt. If you are going to do colour, do it. For example.. these ‘pale eggshell pink’ J Brand.. Are they pink or white? Why be so confusing..
Also, I’m not too crazy about all the greens, too reminiscent of elementary school maybe.. 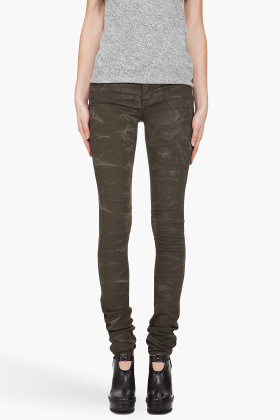 I do however LOVE these Helmut Lang green jeans. They aren’t camouflage, just so you know. They are green with a wisps-of-smoke-like print on them. As always, if you would like to discuss coloured jeans don’t hesitate to call me.